Today I have some MORE great designer content for you! The reaction to Tuesday’s Designer interview was just wonderful. 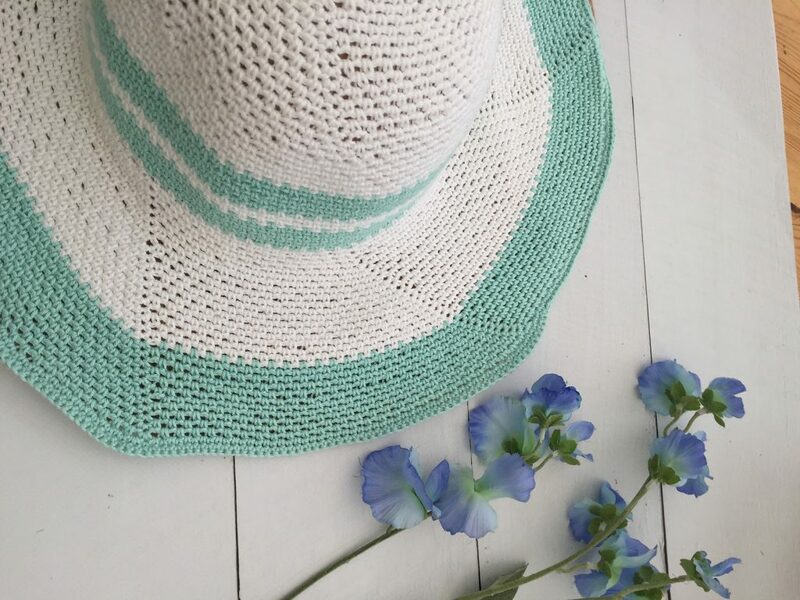 So, I thought today we’d have a little chat with Babs Rudlin, the designer of the Derby Sun Hat in Issue 39 of Happily Hooked. R – Hey Babs! First, love the name. I wish Rohn sounded as cool. Haha! So, where did you learn to crochet? B – My grandmother initially tried to teach me as a child. Over the years I have returned to crochet several times, however, I got so stressed I was always bending the hooks. Just over three years ago I bought a set of ergonomic hooks and haven’t looked back since. Everything Grandma tried to teach me just dropped into place, once I had a hook I didn’t break. I can now hook with ease and the tension and stress I used to hold in my hands have gone. I thoroughly enjoy the textures that can be created with crochet. R – Grandmas are the best, aren’t they? What kind of things do you love to make? B – I really enjoy making blankets, any sort will do, C2C, patched motifs or rows. I don’t particularly like Granny squares though. R – Neither do I! I’m just not a fan of them at all. Now, I know you probably get asked this all the time but where do you find your inspiration? B – Nature and history are an amazing source of design and color choices. Some of which we have forgotten about in our desire to be ‘new’. Taking a design from hundreds of years ago and tweaking it with new yarns or tools can create something utterly glorious. R – As a lover of vintage designs – I couldn’t agree more! Now, for a fun question…do you have any crafty confessions? B – I cannot work on just a single project. I am addicted to casting on a new project and seem to have a consistent 7 projects on the go at any one time. All actively being worked depending on my mood or need for stress relief. R – In the knitting world, they call that ‘start-itis’ or the need to constantly cast on, once you’ve found a new and more exciting pattern! Haha! So, what would you say is your biggest crochet triumph? B – My first Crochet Along of 2017 has been my largest to date. It was a baby blanket, my Trigonus CAL, to use up the leftover yarn from another CAL, by another designer, I had completed the year before. The blanket was a rainbow of triangles which could be created by even a newbie. I was blown away by the response with over 1,500 people signing up to join the CAL. It was an amazing experience and I’m looking forward to creating more community crochet projects in the future. R – I’m a CAL addict…I love to join them all! I’ll have to keep a look out for that. Speaking of which, where can our readers find you online? B – I have a Youtube channel ‘myfieryphoenix’ and a blog at www.fieryphoenix.co.uk. You can see behind the scenes sneak peeks on Instagram @afieryphoenix and I’m ‘MyFieryPhoenix’ on Ravelry. Thank you to Babs for joining me this week and thank you to Y’all! Click here to get started on this pattern and more!